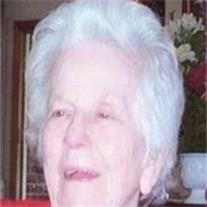 Elsie Mae Hollingshead Bates Tennant, age 90, passed away Wednesday, May 18, 2011 in Howard, KS. She was born June 8, 1920 in Miami, AZ, the daughter of Clem Franklin and Stella (Edwards) Hollingshead. On August 19, 1939 Elsie was united in marriage to Ivan L. Bates in Phoenix, Arizona. He preceded her in death in June of 1972. Elsie married Roland E. Tennant in October 1975 in Mesa, Arizona and he preceded her death in December 1984. Elsie was a member of The Church of Jesus Christ of Latter-day Saints. She is survived by three sons; Ivan Bates Jr. (Rhonda) of UT, Ronald Bates of AZ, Phillip Bates (Susan) of AZ, six daughters; Sandra Suman (Robert) of UT, Bonnie Helms (Burl) of KS, Elizabeth Walker of UT, Gail Heath (Hyde) of CO, Shirley Tryk (Martin) of KS and Donna Schaub (Kenneth) of AZ, 45 grandchildren, 115 great grandchildren and 5 great great grandchildren. Elsie was also preceded in death were her parents, 2 brothers and 5 sisters. Funeral services are Thursday, June 2, 2011 at 10 AM preceded by a visitation at 9 AM at the LDS Ocotillo Ward, 18550 E. Riggs Road in Queen Creek. Arrangements by Bunker’s Garden Chapel.